France is one of those destinations that tops bucket lists across the world. Many people come to the country for its capital and largest city, Paris. Paris has lots of history, charm, and sophistication. It is a fashion capital, gastronomical hub, and home to some of the world’s most famous icons. Once you have spent some time in Paris, explore more of what this diverse country has to offer. There are so many destinations to discover. Spend some time by the Mediterranean in the cities of Nice, Marseille, and Montpellier; visit the south and the famous lavender fields of Provence; taste wines in the world-famous Bordeaux region; and experience the French Alps in the east of the country. France has a fascinating culture and some of the best food you’ll find. If you are looking for a destination for an unforgettable holiday, France could be the place for you. While France is an incredible holiday destination, it can also get expensive. Once you’ve booked flights and hotels, you might not have much left over to plan excursions in the country. But by bundling together your travel expenses, you can save hundreds of dollars with France holiday packages. Webjet offers a variety of France accommodation and flight packages to save you money and time on your trip to France. Rather than spending hours searching for the best deals, let Webjet take care of that while you plan the activities you will do during your holiday. France holiday packages are great for families who would like to save money or for couple looking for an affordable romantic getaway. Throughout France, there are a large amount of airports to fly into. The airport you touch down in will depend on which destinations you're planning on visiting. The two largest airports in the country are Charles de Gaulle Airport (CDG) and Orly Airport (ORY), which are both located outside of Paris. The next busiest airports are serve some of the country’s other major cities: Nice Côte D’Azur Airport (NCE) in the south, Lyon Saint Exupéry Airport (LYS), and Marseille Provence Airport (MRS). Once you have arrived in France, you can catch cheap flights between cities or catch the train on France’s national system, the SNCF. Travelling from Australia, all flights to France include at least one stopover. Major airports that offer flights between the two countries include Virgin Australia, Qantas, Emirates, Singapore Airlines, Cathay Pacific, British Airways, and Air France. Flying to France, you can arrive from Perth in about 20 hours and from the east coast cities in about 23 hours. France offers a wide variety of accommodation options to fit every budget, no matter the destinations on your holiday itinerary. Hotels in France typically offer a sophisticated French design with a homely atmosphere. This gorgeous hotel in the city centre will have you feeling like you took a step back in time the LaBelle Époque era in Paris. The Hilton Paris Opera offers sophistication and luxury without a huge price tag. The guest rooms are designed in a quintessentially Parisian style and are available in seven different sizes. Amenities within the hotel include complimentary breakfast, a fitness centre, free WiFi, and help organises tours and excursions around Paris. The location doesn’t get much better than that of the Hôtel Suisse in Nice, the glittering city in France's south. It is at the eastern end of the Promenade des Anglais with a gorgeous view of the city, beach, and Mediterranean. Within minutes, you can walk from the hotel to the Old Town of Nice, the Castel Plage beach, and the Nice Port. Inside, there are 38 guest rooms with a gorgeous and sophisticated French design. The hotel offers a breakfast buffet, a bar, and free WiFi. If you’re hoping for a room with a view in France, the Villa Florentine in Lyon is a great option. Located within the city’s Old Town, the Villa Florentine is perched on a hill with a breathtaking view of Lyon. It is a five-star luxury hotel, but prices are reasonable for the high quality of the hotel. There are 29 rooms and suites, each decorated in its own unique way. The rooms are designed in a contemporary style with a touch of French elegance. Amenities of the hotel include a heated swimming pool overlooking the city, a terrace, and a fitness centre. France is one of the world's most diverse destinations with so much to experience. There’s the history and sophistication of Paris, the laid-back atmosphere of the Mediterranean, and some of world’s best restaurants in Lyon. No matter how much time you spend in France, there will always be somewhere new to explore. The Eiffel Tower is the most iconic landmark in France. Located on the Seine River in Paris, you can get great views of the tower from many spots around the city. At the base of the tower is a park where you will see both locals and tourists relaxing with an afternoon picnic or a bottle of wine. For a stunning view across Paris, head to the top of the Eiffel Tower. There is a lift available, or you could take the stairs most of the way. From the top of the Eiffel Tower, you can spot some of the other major Parisian landmarks below. For the most magical view over Paris, head to the top of the Eiffel Tower at sunset. Back on the ground, you can experience an Eiffel Tower light show. For the first 5 minutes of every hour, the tower glitters in a beautiful display of lights. In the south of France, you can experience another hot spot, the French Riviera. It is a series of towns and cities along the Mediterranean Sea with some incredible beaches and nice weather year round. Nice is the largest city in the south region. It offers a beautiful beach and an exciting Old Town. Cannes, Antibes, and Saint Tropez are popular resort towns that are known for their beaches. Eze is a medieval village located on a mountain with a view over the Mediterranean. At the end of the French Riviera, you can visit Monaco. Monaco is a small city that is technically its own country and offers lots of glitz and glamour. The best way to experience the French Riviera is to rent a car or a Vespa and make your way from one town to the next. 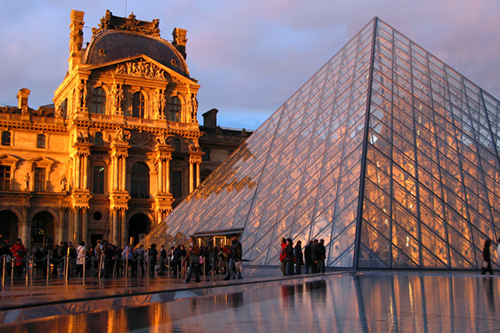 There is only one city in the world that has more museums than Paris. So if you are a fan of art and museums, Paris is the city for you. The most famous is the Louvre. The entrance to the museum is the city’s famous glass pyramid. Inside the Louvre, you can see some of the most famous pieces of artwork in history, including the Mona Lisa. If you enjoy modern art, the Centre Pompidou has the largest collection in Europe. The Musée D’Orsay displays the works of several famous artists, including Monet, Van Gogh, and Renoir. The Grand Palais and the Petit Palais were created for the World’s Fair of 1900 and house a vast array of paintings and sculptures in a variety of styles. If art isn’t your thing, Paris also has museums dedicated to fashion, architecture, and history.